HUNTSVILLE – In partnership with the Alabama Career Center System / Alabama Department of Labor, the City of Huntsville, United Ability, the Alabama Department of Rehab Services, the Alabama Department of Mental Health, the Governor’s Office on Disability, and the Alabama Institute for the Deaf and Blind, Governor Kay Ivey announced plans on Thursday to host the second annual Governor’s Job Fair for People with Disabilities. The job fair will be held on Thursday, October 25, 2018 from 10 a.m. to 2 p.m. at the Von Braun Center in Huntsville during National Disability Awareness Month (NDEAM). NDEAM is a national campaign held in October that raises awareness about employment issues for disabled people and celebrates the many and varied contributions of America’s workers with disabilities. “The City of Huntsville is focused on generating jobs for our hardworking community, and that includes jobs for those with disabilities. I am committed as Mayor of Huntsville that anyone who wants to work should have the opportunity to secure a job. 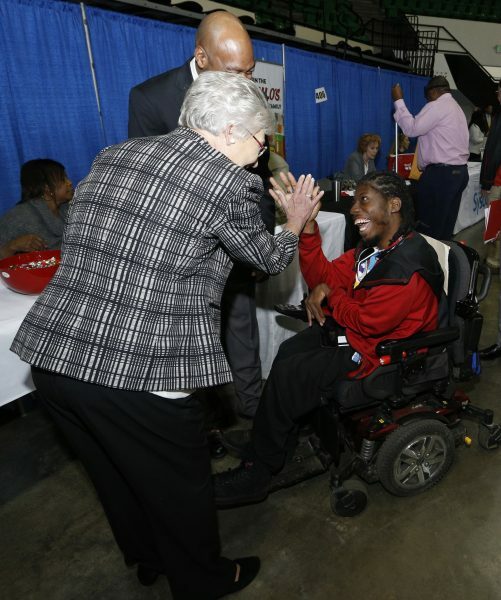 We are pleased to partner with the state and other agencies in offering the first disabilities jobs fair in North Alabama,” said Huntsville Mayor Tommy Battle. The job fair is free for both employers and jobseekers and is open to the public. Employers can register online or by calling the Huntsville Career Center at 256-851-0537. Jobseekers and employers are encouraged to pre-register online at www.labor.alabama.gov/jobfair. Pre-registering will allow for faster entry, and participants are strongly encouraged to print their confirmation and bring it with them to the job fair or to save their confirmation e-mail on their phones. On-site registration will also be offered. If jobseekers have a disability and require accommodations in order to fully participate in this activity, they should contact Leslie Dawson at leslie.dawson@rehab.alabama.gov. The facility is accessible, and buses and vans are welcome. “We are especially thankful for the continued cooperation and enthusiasm of our partners in this event, Governor Kay Ivey, Mayor Tommy Battle, the City of Huntsville, and all of our other agency partners. The dedication and collaboration between local governments, state government, and private industry is what makes these job fairs a success,” said Washington. Applicants should come to the job fair with multiple copies of their résumés, be prepared to interview and should be dressed professionally. Interview space will be provided. Members of the media needing more information should contact Tara Hutchison at 334-242-8616 / tara.hutchison@labor.alabama.gov.